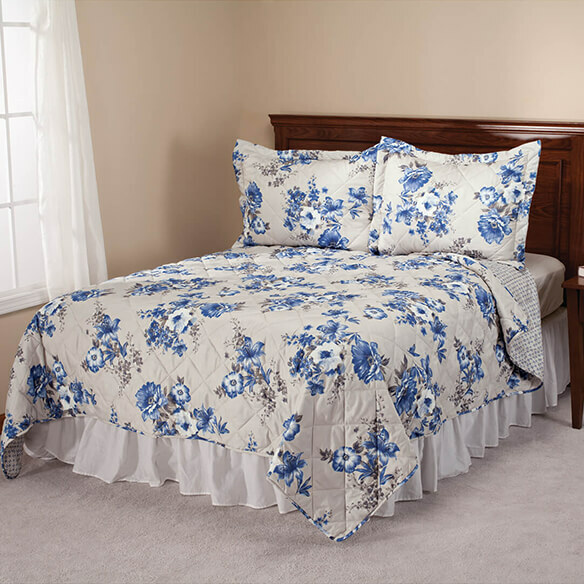 Our Charlotte reversible microfiber comforter by OakRidge™ adds timeless elegance to any bedroom. Reversible design features 2 classic floral prints in a beautiful pink and blue palette. You'll love snuggling up under this microfiber comforter that's lightweight and breathable in summer, warm and cozy in winter, and cuddly-soft year-round. Add our coordinating Charlotte shams for the perfect finishing touch to your bedroom décor (sold separately). Machine wash warm; tumble dry low. Imported. What are the dimensions of the king size quilt? BEST ANSWER: Thank you for your question. The King is 120"Lx114"W. We hope this information will be of help to you.